Imagine yourself under the sea – guiding your own submarine as you explore the lakes and oceans. 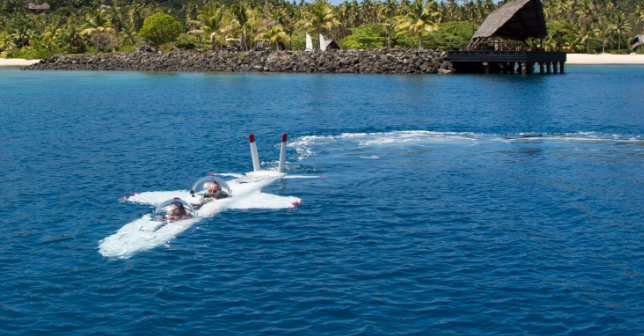 If this sounds far-fetched, it is quickly becoming a reality from company DeepFlight, with a new type of underwater submersible that makes it seem as if you are flying underwater. With 94% of Earth’s life in the ocean, the innovation subs give users access to more of the planet. The innovative submersible is usable by most people with only a little training. Operated by joysticks for depth and direction, the sub is capable of going to a 400-foot depth, the depth at which the ocean becomes black to the human eye. The lithium batteries provide six hours of underwater flight and the sub is capable of sustaining 24 hours of life support. And, it can’t sink. The units are “positively buoyant” meaning that it requires motion to remain underwater – switch it off and it floats to the surface. The design is sleek and futuristic, weighing 4,000 pounds and with a length a little over 16 feet. But, at a $1 million price tag, it is not for everyone. Units could be obtained by individuals, but also by charter and tour operators to give customers a unique view of our underwater world. Are you willing to fly in the blue waters of Earth?